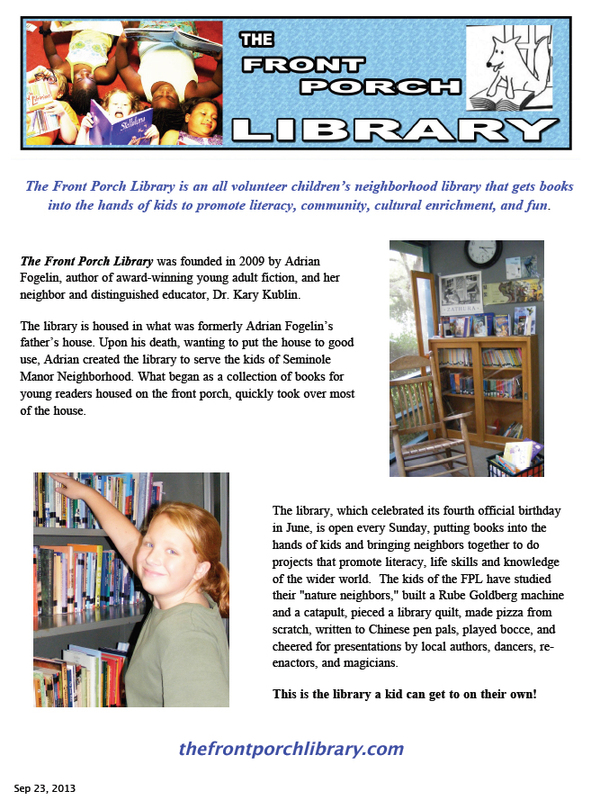 The Front Porch Library is a children’s neighborhood lending library that gets books into the hands of kids to promote literacy, community, and fun. Q: How many books do you have in your library? A: We have about 3,000 books cataloged in our collection — which is pretty extraordinary when you consider that our physical space is only about 9 ft by 11 ft. Chapter books, series books, nonfiction, poetry and joke books are all on shelves. Picture books and board books are in crates that we unstack and spread out on the porch and yard during library hours. Q: Don’t you have problems maintaining a library collection in an outdoor space? A: Yes, we do. There are particularly humid days when the covers on the paperbacks all start curling and the posters are falling from the walls. There are days in the winter when the temperature changes dramatically and our stucco walls are literally weeping. We’ve countered that by using some cabinets with doors and by covering the other shelves when the library is not in use. A: Yes, we accept new and gently used children’s books. Q: Are there any particular kinds of books you need? A: We would like to have more nonfiction books and more board books. Q: What do you do with the books you can not use in your library? A: Some become part of the children’s library at Hope Community. Some are given to children to keep. And the ones that we can’t use or that are religious-themed are taken to Goodwill. Q: How are your books cataloged? Q: How many books can be checked out at a time? A: Children can check out up to 4 books at a time. No due dates. Q: Can I come see your library? A: Sure. You are welcome during regular library hours. But contact us first please. Q: Can I volunteer at your library? A: Many of our volunteers come from our own neighborhood. We welcome volunteers from outside the neighborhood; however, we only accept volunteers who are able to come weekly during our library hours, who can commit to a semester or more of volunteering, and who have a vested interest in our mission. Q: Can I donate money to The Front Porch Library? Is The Front Porch Library a 501(c)3 organization? A: YES, we would most certainly accept a monetary donation. We are not a nonprofit organization, but our neighborhood association is. Should you wish to write a check, make it out to Seminole Manor Neighborhood Association, which is a 501(c)3 nonprofit. Your gift may be tax deductible. Contact us by email and we will fill you in on where to send money, the details of our budget and how your money would be put to good use. Q: What if I didn’t get my question answered here? A: Contact Kary at frontporchlibrary (at) gmail [dot] com for more juicy details. Where are you located, please? I see no address on the website and would like to attend Sunday’s 5th anniversary open house. Thank you. Thanks for stopping by our website, Mary Ann. We’ll provide you with the address directly. Just send a message to frontporchlibrary ^at^ gmail *dot* com. We’re working on that. Stay tuned! hello Ms. Adrian. This is Isaac Bakan . I was wondering if front porch library is still going on over the winter break. Hi Isaac — We’ll be here. No library on Dec 27 but we will have library on Jan 3rd. I contacted you earlier about partnering with a local chapter of the DAR. Would it be possible for me to visit this Sunday afternoon?